Throughout August and September, Exotissimo Travel will host a series of FAM trips to each of its popular destination countries across Southeast Asia. Each trip showcases the understanding and commitment Exo has in delivering immersive and experiential tours. It’s a fantastic opportunity for travel agents to familiarize themselves with Exo’s work ethics, tour guides and delivery of the product. Encompassing hotel inspections, the trips give a thorough cross examination of what Exo can offer as a leading destination management company. 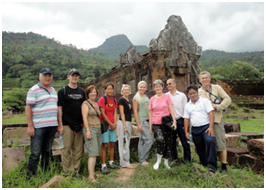 The trips have been selected from an extensive range of tours that are available to travel agents now. Programs chosen cover a range of experiences from cultural to culinary, and adventurous to luxury, while demonstrating value for money and unprecedented insights into local customs. Indonesia continually increases in popularity and it’s easy to see why after visiting this paradise. Two islands in particular, Java and Bali, boast a wealth of attractions. Our FAM trip ‘Two Islands – Java and Bali’ includes scenic train rides, watching the sunrise over Bromo volcano and white water rafting.